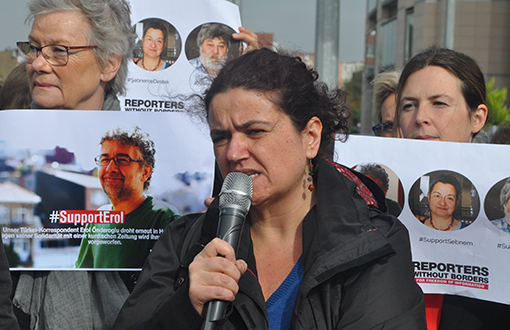 An İstanbul court on Thursday sentenced Kurdish journalist Arzu Demir to six years in prison over her two books on outlawed Kurdistan Workers’ Party (PKK) over propaganda of terrorist organization. According to the decision by İstanbul 13th High Criminal Court, Demir was charged with “propaganda for an [illegal] organization”, “praising the crime and the criminal” and “inciting people to commit crime” by her two books titled “Dağın Kadın Hali (Womanly State of the Mountain)” and “Devrimin Rojava Hali (Revolution’s State of Rojava)”. Speaking to Bianet news portal, Demir said her trial was a “cyclical political trial” as she was expecting the prosecutor to impose penalty from an upper limit. “I was expecting this. My response is: I am glad I wrote, I am still writing,” she said. She was sentenced to three years in for each of her books. Demir’s book “Womanly State of the Mountain”, which comprised interviews with 11 female militants of PKK, was published by Ceylan Publishing House in November 2014. Following its 7th issue, İstanbul 3rd Penal Court of Peace has banned the book to be printed and ordered the book be pulled off the shelves.